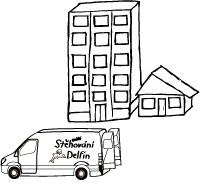 We move residential (houses, flats, offices) and non-residential spaces (warehouses, workshops, garages). We move fast and offer good quality at cheap prices without any further fees. Thanks to our huge experiences we can move you abroad easily. Take a look at our pricelist or use the tentative order application; we will contact you straight away. If you would like to use any of our services, there is nothing easier then contacting us. We will be happy to take care for everything! You will find more information about our company in About Us section. ©2016 Rychlé Stěhování Delfín s.r.o.